Whether looking for land to purchase for farming or planning the use of an existing property you own, the task of understanding and taking advantage of the unique environmental qualities your site has to offer can be daunting. As with any ecosystem, the ecology of a farm is complex, and takes time to unravel. Taking the time up front to properly understand your landscape means a greater likelihood of success down the line. Before discussing some practical tools for evaluating land, its important to emphasize that in my experience, the most successful farmers spend time listening to the land, in other words learning directly from it the limits and opportunities a given parcel has to offer. In most cases, it is far better to match a given enterprise or system to the land, rather than try and work to shape the land to match the system. This is, in fact, the underlying concept behind the scale of permanence. Thanks to Owen Hablutzel for use of this image. The basic idea is that, as one moves down the list, the elements of a farm system become less permanent; that is, they take less energy to change and are less permanent as a factor for planning, as indicated by the graphic. Looking at the list, we can note that the factors of landform and water, while potentially changeable on the farmscape, would require large machines moving earth around, while the simple planting of a bed of flowers or the removal of old farm debris could dramatically improve the aesthetics and experience of a site. In the same sense, building a proper pond (landform, microclimate) would be a change that would last hopefully at least several hundred years, while a well-installed livestock fence (buildings & infrastructure) would be impressive if it reached the 100 year mark. The exact order of the list can be variable depending on the site and situation. One item on the list might come as a surprise to some: #10, or soil, is far down on the list, which implies that it is relatively easy to change. While it is true that largely the structure (sand/silt/clay) and parent material (bedrock) of the soil are certainly permanent and nearly impossible to change, having in some cases formed over thousands of years, as farmers we know that one of the quickest item we can affect is the health and vitality of our topsoil, or the top 10 – 24”. Through rotational grazing, amendments, cover cropping, aeration, etc the change in productivity and organic matter can in fact change rapidly. Another brain twister is #4, which is called invisible structures, meaning the unseen forces that affect the landscape. I personally like to call this “social and economic factors” that affect the farm, which can be anything from your personal finances to the influences of neighbors or the zoning and legal limitations of your municipality. This again might be higher or lower on your personal list depending on where you live and what your specific situation is. Another one that may not be obvious at first glance is Zones of Use, #9 on the list. This refers to the zone planning tool in permaculture, which encourages assessing and also designing activities on the farm in relation to energy and resource needs. The chart gives a rough sense of how zones could be divided up. As with all things, context matters, and various enterprises don’t always fit into a neat little box. For example, on our farm, the woodlot is not zone 4 but zone 1; we harvest mushrooms there almost daily in the growing season, as well as raise ducks, tap trees for syrup, and host kids programs in the woods. On other farms, the woodlot may only be visited in the winter or spring for firewood harvesting. Zooming back to have a look at the whole list, it is likely that a few of the items will be the main challenges for you on your land. The degree to which others have been decided for you in the past also comes into play here; some sites are a “clean slate” while others already have established infrastructure and patterns of use. Especially in the latter case, it’s worth considering making changes if the previous owner’s decisions don’t match with your own. In my experience, the most critical elements that rise to the top for most farms and landscapes are water/landform, access and circulation, and microclimate. Paying careful attention to these aspects of the farm planning are critical to avoiding costly problems and headaches years after you get going. Of course, none of the elements can be considered alone, as all the parts of any system always operate in relationship to one another. For example, planning for road and pathways along with access and circulation can avoid flooding damage to critical infrastructure. Fencing paddocks that are a similar microclimate will also help you consider management as the variable season unfolds each year. And thinking about how you move people, animals, materials, etc around the farm will same you precious time and energy, which may seem insignificant in small doses but definitely adds up over time. There are many useful applications of the scale of permanence. The first is to simply create your own list of the elements that are important to your planning, which might mean eliminating some from the above group. Second, you can describe with words and even map with drawings each of the elements to get a better sense of your landscape, or a piece of land you are considering for purchase. Note that extremes are more important than averages for weather data. Pay particular attention to aspect (direction a slope faces) on your land. Local markets Consider the local ordinances and laws that might affect your choices.. Consider what social connections and networks will be critical to success. Paths, roads, gates, etc Another good category to make a map of. If you have been using the land, try and track your daily patterns on a map. Note where your efforts are inefficient. Slope/aspect and affects Make a “bubble map” to delineate areas of the land that would have different microclimate. A combination of effects in the list creates these conditions. Zones 1 – 5 Make a map of existing and/or future zones based on your planned intensity of use. Ease of navigation This might be just an overall description with some notes, or a mapping activity. Note that this is a very subjective category, beauty is in the eye of the beholder. Steve Gabriel is a farmer in Mecklenburg, NY and extension educator for Cornell Small Farms Program as well as editor for this publication. He can be reached at sfg53@cornell.edu. 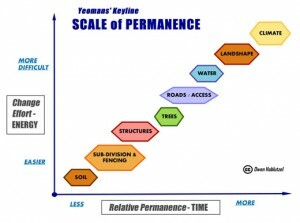 I have never heard of the scale of permanence. However, you have described it in great detail and it sounds like a very useful tool. I appreciate you sharing – thanks so much! Nice job unpacking what can often seem a little opaque in the literature. I’m putting together a curriculum for a couple of upcoming classes and this will certainly be helpful. Thanks.